Troubleshooting a small gas engine that won't start requires a series of short tests and the process of elimination. Understanding the principles of how a small engine operates is helpful but not necessary. Proper disposal of hazardous liquids will be required. The knowledge gained in the performance of this procedure can be applied to many different types and sizes of internal combustion engines. The average weekend mechanic can complete the process in about an hour. Its all about spark and gas. Put on the safety glasses. Remove the gas cap and check that there is gas in the fuel tank. Look at the inline gas cutoff valve located below the gas tank on the fuel line and make sure it is in the on position, with the knob turned straight in line with the fuel line. Look at the spark plug and check that the wire is securely plugged onto the plug. 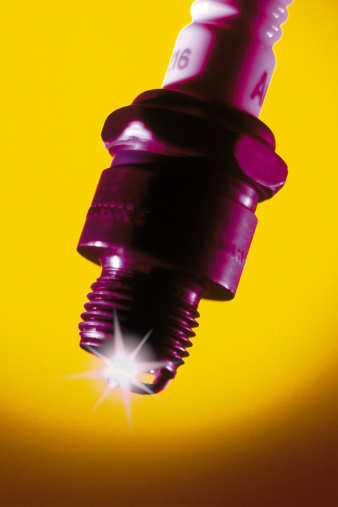 Try to turn the spark plug by hand and make sure it is screwed firmly into the hole. Look at the ground strap by the spark plug and make sure it is not touching the spark plug. Look at the kill switch located by the controls and make sure it is in the run position. Remove the air filter by unsnapping its box-like cover or removing the wing nut that holds it onto the carburetor. Lift the air filter out of the holder and set it aside. Spray a shot of starting fluid from the aerosol can into the empty air filter area of the carburetor and try to start the engine. Let the engine run about 30 seconds or until it dies. Eliminate the electrical system as the cause of the problem if the engine started right up, ran a few moments, and quit. Remove the gas line from the carburetor by loosening its hose clamp with the screwdriver kit. Hold the fuel line over the clear glass container and let some gas run into it. Look at the gas, checking for water and impurities. Drain the gas tank if the gas looked impure. Remove the gas filter from the fuel line by loosening its hose clamps with the screwdriver kit. Replace the gas filter with a new one if the gas did not run into the glass at a rapid pace. Reinstall the gas line and gas filter. Fill the gas tank with new gas. Find a small drain bolt located on the very bottom middle of the carburetor. Place a small container that gas won't melt under it and remove it with the wrench kit. Let the old gas drain out of the bottom until the new gas starts to flow out. Screw the drain bolt back into the bottom of the carburetor. Clean up any spilled gas off the motor and elsewhere with the shop rag. Place the rag in the metal bucket a safe distance from the work area. Clean the air filter with warm, soapy water if it is the spongy type, or replace it with a new one. Install the air filter. Start the engine. Unplug the spark plug wire from the spark plug if the engine did not start. Hold the insulated part of the spark plug wire with one hand and place the bare part about 1/4 inch away from the top of the spark plug. Try to start the engine and watch for a spark between the wire and the plug. Replace the spark plug wire with a new one if it shocked you through the insulation. Remove the spark plug using the spark plug wrench and replace it with a new one if there was a spark. Try to start the engine. Let the engine run until it performs smoothly. Do not do anything else if there was no spark, as the trouble is inside the internal workings of the engine and requires professional repair and tools.